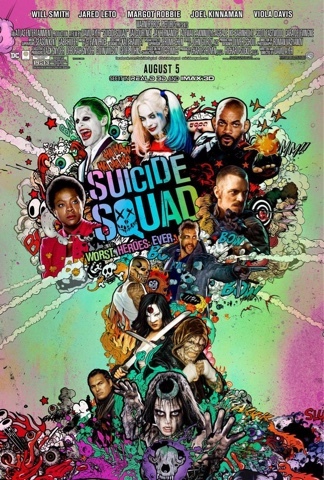 Suicide Squad is the third film to be released in the DC Extended Universe series of feature films. The events of the movie takes after Batman V Superman: Dawn Of Justice, but before Justice League, which will be released next year. Like Man Of Steel and BVS before it, the film has proven to be somewhat controversial after a majority of film critics released unfavorable reviews that resulted in the film receiving a low score on Rotten Tomatoes. While I had some issues with Man Of Steel and the theatrical cut of BVS. I can state without hesitation that I liked the Ultimate Edition of Batman V Superman: Dawn Of Justice so much that I recommend all those interested in that film to check out the Ultimate Edition now that it is readily available on home video. In addition while I still think Superman: The Movie is one of the best comic book films ever made and launched what was then a modern era of Superhero films, I recognize that Man Of Steel was a new take on the mythos behind that character and while I might not like all of the creative choices made in both Man Of Steel and Batman V Superman: Dawn Of Justice, I know family members and friends that liked them more than I did and certain things that worked in the past seem quaint by contemporary standards to such an effect that younger generations look upon the older films from the 1970s and 80s and find that these films are not relavent to them. That does not mean these films are antiquated or obsolete because I believe appreciation for them will grow among the young generations as they mature in the same way people born in my generation can appreciate cinema made before even our parents were born. So like the the previous comic con trailer for BVS and early trailers for Man Of Steel, Suicide Squad's comic con trailer does not live up to the feature film, but few films ever live up to their trailers. That is part of the reason why Honest Trailers by Screen Junkies is so popular. I will state that there are some scenes where the editing choices either feel abrasive or simply odd. Scenes from the trailers are missing from the theatrical film, but there are a ton of well respected genre films that lacked scenes that appear in the trailer. It might be a little disceptive, but it happens. The casting for Suicide Squad is for the most part quite good with standout performances by Violla Davis and Margo Robbie. Will Smith's charisma softens up his portrayal of Deadshot a bit. I really have not seen Smith play a straight villain ever. The closest and arguably one of his best acting performances was in the big screen adaptation of Six Degree Of Seperation, but even in that film his character is more of a delusional hustler than a traditional villain. Even Jai Courtney as Captain Boomerang fitted into the ensemble well and that is what one has to remember when watching a film like this. While not everyone will have as much screen time as one may like, this is called Suicide Squad and not Harley Quinn And The Suicide Squad. It is true that the Joker only has a small role in the film. In fact ten minutes of Joker scenes were cut from the theatrical cut and while I hope some of the original footage as well as scenes from the trailer and all the Joker scenes will find itself on to an Ultimate Edition of Suicide Squad on Blu-Ray Disc, I did find myself wanting to see more of Leto as the Joker, which I think in this case is a good thing because it gives a mystique to the character and sometimes less is more. Think about the first two Star Wars trilogies and who was the character in each that everyone remembers, had only a bit of screen time and people still won't let the villain die? Darth Maul and Boba Fett. I think for this film, Joker holds a similar position and I hope we will see more of Leto's Joker and Robbie's Harley Quinn in a future DCEU film, including a Batman solo picture. There was a scene where the characters are tempted by the villain with visions of what they really want, but probably can never have and while I understand the dramatic choice as to why Deadshot sees what he sees, I did not buy into that being something he wants more than anything else. The musical choices are very much hit and miss. I think they may have been trying to go for the type of style Quentin Tarantino has used successfully in the majority of his movies where he does not have an original score produced and instead uses in no chronological order various songs and music that emotionally charged a scene or helps to establish character and or mood, but Tarantino is what I call a Master Filmmaker and it is very hard to do what he does naturally just as effectively because Tarantino is just innately gifted with a definitive style and vision that can be copied, but rarely equalled. That noted, can anyone imagine how Suicide Squad might have turned out if Tarantino wrote and directed the film? Someone did and made a YouTube parody that I will place a link to beneath this review for your enjoyment. Suicide Squad is not a perfect film, but I enjoyed it for what it was and if one goes to see it, they should approach it with an open mind and a bucket of popcorn. Suicide Squad is now playing at the time of this writing in theaters nationwide and abroad too. (C) Copyright 2016 By Mark A. Rivera.